Garet Beal of Beals Island and his mother Pam pose on Monday night as Beal had his jersey No. 24 retired by Jonesport-Beals High School. He is the first male player to be so honored at the school. University of Maine's Garet Beal (left) reaches a stray ball before University of Vermont's Dre Wills during the first half of their game Wednesday, Jan. 7, 2015 at the Portland Expo in Portland, Maine. The working waterfront along Moosabec Reach is largely quiet during the dark of winter, the coastal area’s fishing industry slowed by the often harsh grip of Mother Nature. Garet Beal saw that from the warmth of a basketball gym while growing up on Beals Island. These days, he witnesses first hand the change of seasons as he runs what once was his grandfather’s wharf at Barneys Cove Lobster Co.
It’s a labor borne of family tradition and personal love. The slow winter season leaves watching basketball as a favorite pastime for most of those who call Beals Island and neighboring Jonesport home. The past six decades since consolidation created Jonesport-Beals High School have seen plenty of championship dreams realized, beginning with the five straight gold balls won by the school’s boys basketball teams from 1970 through 1974 and continuing through the Royals’ most recent state crown in 2012. That championship squad was led by Beal, a versatile 6-foot-5 guard who averaged 22.3 points, 8.7 rebounds, 3.8 steals, 3.6 assists and 1.6 blocked shots during the 2011-12 season, and became the second of just three Maine high school juniors — along with Winthrop’s T.J. Caouette in 1995 and Portland’s Terion Moss in 2017 — to win the Gatorade Maine Player of the Year award in boys basketball. Beal went on to set the school career scoring record as a senior before becoming the first boys player from Jonesport-Beals to play NCAA Division I college basketball. 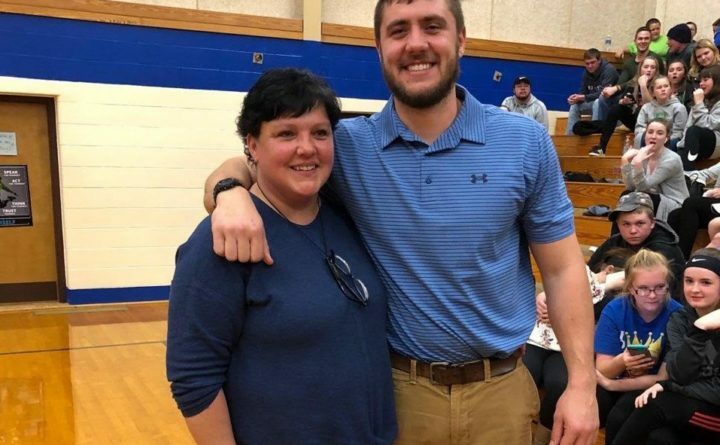 The former University of Maine Black Bear was to be recognized Monday evening for his high school achievements with the retirement of his uniform No. 24 between games of a home girls and boys doubleheader against Deer Isle-Stonington. Beal is the first Jonesport-Beals boys basketball player to have his basketball number retired by the school, joining two former schoolgirl basketball standouts who also went on to play at the NCAA Division I level — Sandi Carver (UMaine) and Jan Beal (New Hampshire), according to athletic administrator Dan Campbell. “I’ve always taken a lot of pride in representing where I was from even after I got out of high school,” Beal said. Beal was a four-year starter at Jonesport-Beals who led the Royals to a 71-9 overall record and the 2012 Class D state championship — the program’s first since 1993. He went on to sweep the state’s Mr. Basketball and Gatorade Maine Player of the Year awards as a senior after averaging a robust 34.0 points, 10.7 rebounds and 5.5 assists while playing less than 24 minutes per game as Jonesport-Beals went undefeated during the regular season and qualified for the Eastern Maine Class D quarterfinals. Beal set school records during the 2012-13 campaign with 55 points in a single game and with his 1,686 career points — in both cases surpassing marks set by his late father Lindell Beal, who died during the summer before Garet’s senior year at Jonesport-Beals. Beal was selected to the Bangor Daily News All-Maine team for the third straight season in 2013 as well as being named the state’s Mr. Basketball and to the 2013 Parade All-American team. Beal battled through frequent injuries to play in 52 career games at UMaine before foot surgery ended his senior season prematurely after he was named a tri-captain of the 2016-17 team. These days Beal’s basketball is limited largely to playing in a Down East men’s league, and while he has not attended many of his high school alma mater’s games this winter, he does keep track of the Royals’ progress. Among the players on this year’s team is his cousin, junior captain Kaiden Crowley, and the Royals entered Monday night’s game against Deer Isle-Stonington ranked atop the Class D North standings with a 6-0 record. Beal said he has a lot of people to thank for a basketball experience that has led to having his number retired. “Most certainly my parents,” he said. “They sacrificed a lot of time and money to get me to places and do things that not a lot of people are able to do. And certainly my coaches I’ve had throughout the years, the friends who have spent countless hours rebounding when they probably could have been doing something else with their time, and the people that have followed me throughout my entire career.